Southend will soon have its own energy company for the first time in over 60 years. This is after the Council signed up to an agreement to form a new local energy company working in partnership with energy supplier OVO Energy. Following approval by the Full Council to form the company on 26 February, the Council has now signed a legal agreement with the firm to establish the initiative. It will be the first time Southend has had its own energy company since Southend-on-Sea County Borough Corporation was disbanded in the late 1940s when gas and electricity energy industries were nationalised. The company, whose name is to be decided upon along with other marketing details in the coming weeks, is expected to be launched in the next few months and will be available to residents and businesses with a Southend-on-Sea postcode. Competitive tariffs will be available to residents and businesses in the Borough looking for a local alternative to their current supplier. There will be particular benefits for the Borough’s most vulnerable customers – those who are fuel-poor and those on pre-payment meters. Cllr Graham Longley, Executive Councillor for Enterprise, Tourism & Economic Development, described it as a landmark agreement. 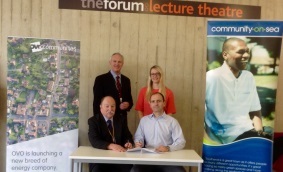 Signing the agreement at The Forum with Managing Director of OVO Communities, Craig Morley, he said: “Today is a major milestone for Southend. What we’ll be offering is attractive energy tariffs, fair contracts and a means of keeping local money in the local economy. Our decision to partner with OVO is also reinforced by the supplier recently becoming the first “Which? Recommended Provider” for energy. “There’s a huge opportunity to save money by switching energy suppliers. Indeed, the most recent Essex Big Energy Switch resulted in participants saving an average of £260 on their energy bill in a single year.